The software is free for Personal Non-Commercial use. Users can free distribute, install, copy, backup, or upload the software to computers or websites. Free Office Tabs - Tabbed Browsing, Editing and Managing for Microsoft Office 2003, 2007 and 2010. Works with all editions of Office: Enterprise, Ultimate, Professional Plus, Professional, Standard, Home and Business, Home and Student... Unlike web browsers -- Internet Explorer 8, Firefox or Chrome, Microsoft Office does not use a single window to hold multiple files for viewing and editing. The product lines of Office Tab improve the ability of MS Office, and bring the tabbed user interface to Microsoft Office 2003, 2007 and 2010 (include Word, Excel and PowerPoint). 1. 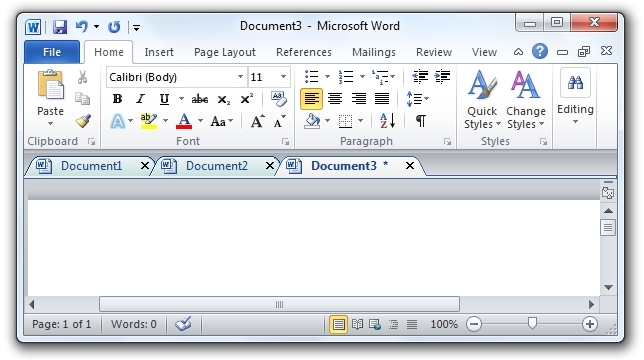 Open, read, edit and manage multiple Office documents in a tabbed window, 2. Using tabs for switching between documents. 3. Easy to use, just like IE 8, Firefox and Google Chrome. 4. Without filling your desktop with new, unorganized Office windows. 5. Based on Microsoft Office Standard Add-in technology. Save all documents in one click! Easy determine which file has been changed, which has been saved: Office Tab will mark these modified documents or workbooks with an asterisk (*) in their names to indicate the modified documents or workbooks (except in PowerPoint). You can close a tab by double-clicking the left button on it. You can close a tab by clicking the middle mouse button once. "Close All": close all files in the tabbed windows (a confirmation dialog box will appear when you choose to close all files). "Close Other": close other files (exclude current file) in the tabbed windows. Quickly Rename. This function is different from "save as", once "rename" is applied, the document file under the original name does not exist anymore. This site does not contain serial number, crack, keygen Office Tab Free Edition serial number : serial number is the simplest type of crack. A serial number(cdkey,product key,etc) is register the program as you may already know. a crack or keygen may contain harmful software. If you cannot find the exact version you want, just give it a try. for more information read .nfo/.txt/.diz file include in zipped file.